Sovereignty with peace and security, one of the last milestones to the kingdom? 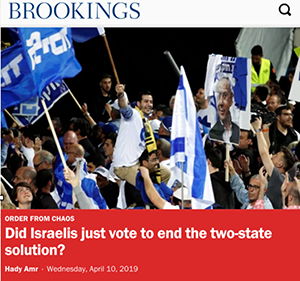 Israel’s high stakes election ended with Netanyahu promising to annex parts of the West Bank, but it seems like the promise of annexation wasn't really as out of the blue at it seemed. From Ezekiel 38 we can expect peace to emerge in Israel that allows the Jewish population to stay in Judea and Samaria ("the midst of the land")long enough for prosperity to develop. This passage outlines some details of the peace and also, an interest in the situation by a group of nations. Maybe this is just genuine care for the Jews, but it could also be that they have a vested interest in the area at this point. Why the comment about Gog knowing about the "peace and safety"? Is Gog simply opportunistic and sees that their guard is down? That could be, but it seems more likely that there is something about the establishment of the peace that Gog and his crew are unhappy about. This is becoming clearer as events unfold. As these things come to pass, we need to always remember that it is the hand of God behind the scenes. He has now given all into the hand of His Son (1 Peter 3:22) who is now orchestrating all these things through the angels. The team that the angels have assembled is impressive, and a massive shift from the old one we had in the US only a few years ago, and the situation in Israel has changed dramatically as well, despite many of the players being the same. Consider that Israel now leans toward annexing Judea and Samaria. What a tremendous shift from the Disengagement. All members of the ruling Likud party support it to some extent. Netanyahu promised it at the end of his election campaign causing great waves and sucking many votes out of the smaller right-wing parties. Basically, the entire 65 seat right-wing block would support it. Including Lieberman, even though he may disagree with many in the block about issues of religion and state. 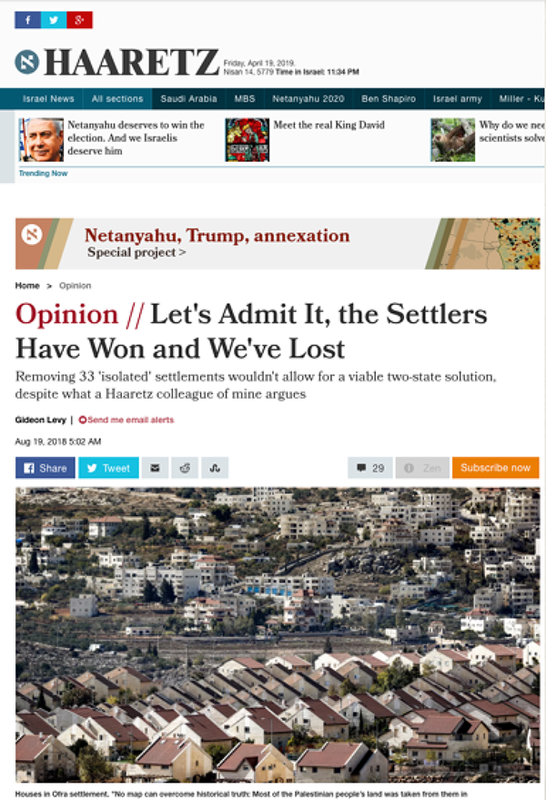 A Haaretz poll found that even a large portion of left-leaning Labour voters would support some amount of annexation. Refuses to back a two-state solution. Refers to past actions as an indicator of future ones. 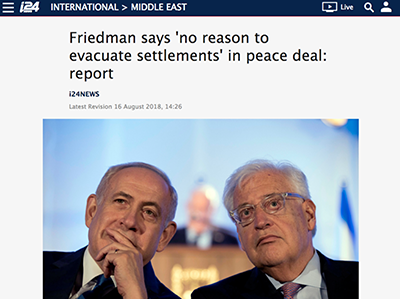 David Friedman stated at the most recent AIPAC (American Israel Public Affairs Committee) conference that peace in the Middle East comes through strength. Israel would face an existential threat if Judea and Samaria are overcome by terrorists, like Gaza. Israel needs a permanent presence in Jordan Valley. Because of Israeli sovereignty in Jerusalem, the city for the first time in 2000 years is open to worshippers of all three Abrahamic faiths. Peace comes through strength in the Middle East, not just words on a paper. Many of these points are highly loaded statements. His comment about Judea and Samaria being overcome by terrorists is saying that they cannot pull out of it as they did in Gaza. Overriding security control means the IDF needs to stay. The praise of the situation under Israeli sovereignty in Jerusalem is paving the way for Israel to extend sovereignty in more areas. The "words on a paper" comment actually diminishes the value of a written agreement at all. Peace through strength, he offers as a more reliable way to peace. President Trump himself: Whatever we think of him, as an individual, the men he chose to help him with Israel speak volumes about him as a president. Recognizing Jerusalem and the Golan Heights were high priorities for him. He has placed people in power that favor Jewish settlement of Judea & Samaria and are working for Israel’s peace and security. Secretary of State Mike Pompeo: There is a video clip of him in the slideshow where he agrees that Trump may be an Esther-like figure raised up to save Israel. He seems to state that Jerusalem will not be divided in the plan and, while in Israel, says that he is confident that "the Lord is at work here..."
John Bolton, National Security Advisor of the United States: Bolton is known for his strong support for Israel. Bolton opposes the two-state solution of creating an independent Palestinian state alongside the existing state of Israel. David Friedman - US Ambassador to Israel: A close friend of President Trump and an Orthodox Jew. He is a bankruptcy lawyer and helped Trump immensely when his companies were in trouble. He was previously the head of American Friends of Beit El, an organization that funds many projects in the area. He is an avid settlement supporter and it seems that Donald Trump would do things just for the sake of making him happy, personally. Some Palestinian supporters have complained that he is more of an ambassador of the settlers to America than of America to Israel. Jason Greenblatt, US Representative for International Negotiations: Haaretz said at the time he was appointed "How did an Orthodox ex-settler become Donald Trump's Israel advisor?" What need we say more? Joel 3:8 comes to mind. Jared Kushner the last team member mentioned is also an Orthodox Jew. He is tight-lipped, but the little that you can learn about him leads you to believe that his views on Israel differ little from David Friedman's or Jason Greenblatt's. So, What About the Plan? "US Secretary of State Mike Pompeo on Friday said he did not believe Prime Minister Benjamin Netanyahu’s talk of extending Israeli sovereignty to West Bank settlements would hurt the Trump administration’s long-gestating peace plan. 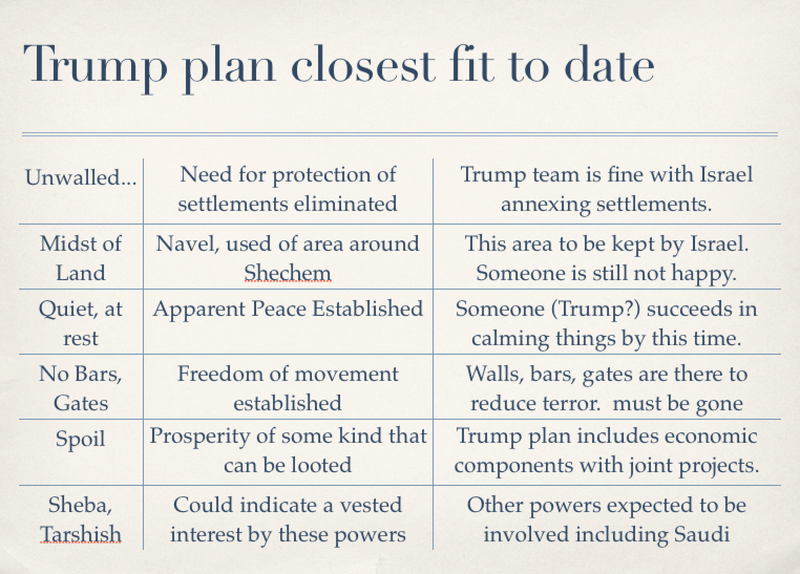 "His comments would appear to indicate that the US plan does not provide for Palestinian statehood, or even for Palestinian control of substantive contiguous territory in the West Bank. 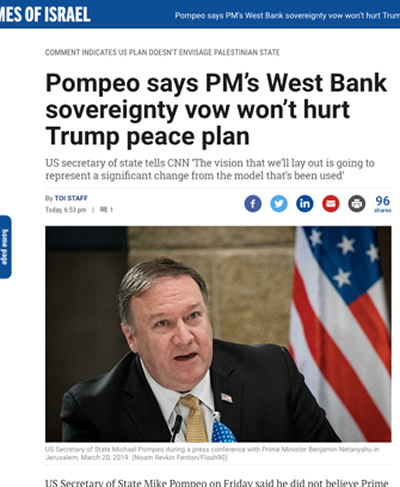 Asked during a CNN interview by anchor Jake Tapper whether he thought Netanyahu “vowing to annex the West Bank” could hurt the US proposal, Pompeo answered “I don’t.”"
From this, we can be all but certain that the plan doesn't require any Jews to be removed from their homes. Not only that, but they will be under full Israeli sovereignty. That fits the prophecy, which greatly increases the likelihood that we're seeing the start of something that will actually work. There is in the video version a clip of Caroline Glick, where despite failing to make it into the Knesset as part of The New Right party she joined, is excited that Benjamin Netanyahu and Donald Trump are implementing key components of her plan. She says that what they are doing isn't enough, though. I say, wait and see, we haven't seen the end of the story yet. The left sees the shift as well, but aren't so comfortable with the notion. There are those in Israel and some Palestinians that want to forge an economic peace on the ground. David Friedman says that the US will support them and projects are moving ahead. There are various pieces of information that can be found on the subject on the internet. An amazing aspect of all this is that the reactions in the Arab world are not all what you might expect. 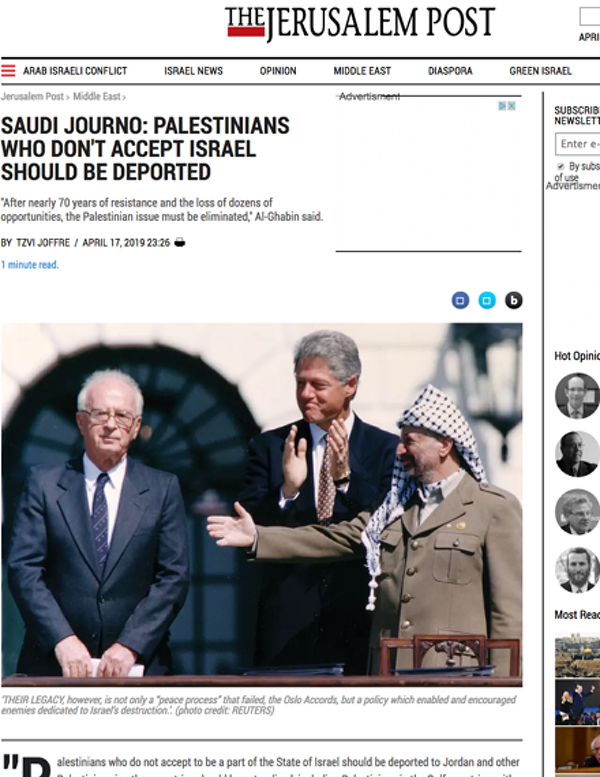 “Palestinians who do not accept to be a part of the State of Israel should be deported to Jordan and other Palestinians in other countries should be naturalized, including Palestinians in the Gulf countries, with compensation," Abdul Hameed Al-Ghabin, a Saudi Arabian writer and political analyst, said in an interview on Saudi Arabian television. There's "no chance that everything will be changed for Jerusalem," Al-Ghabin continued. "It doesn't interest us what happens with Jerusalem as much as peace between the states interests us. We need to calm things down and make a true peace between the two sides." The interview was part of an discussion under the title "The Palestinian Peace Deal: After 70 years the chances of a Palestinian deal are in dire condition." He talks of missed opportunities. One of them that he might be referring to is when Ehud Olmert offered them more territory than they had in 1966. Saheeb Erekat admits this and that they declined. The Saudis think they are nuts. So, we could go on, but just consider this chart. On the left are things from Ezekiel 38, on the right are things that we are seeing. It is coming together before our very eyes! "There were many fine artists who brought their paintings to the embassy, but I chose precisely this one. And the reason is as follows. A person can ask: What was the spies’ sin? They were telling the truth and even brought back fruit to prove their account. So why is it considered such a big sin that we suffer from until today? "The answer is that after witnessing the Exodus, the Giving of the Torah, and all the miracles that G-d performed for them in the desert, they didn’t have the faith and confidence that G-d would deliver them to the Land of Israel. The sin was not that they didn’t tell the truth; the sin was that they lacked faith, they lacked vision and confidence. 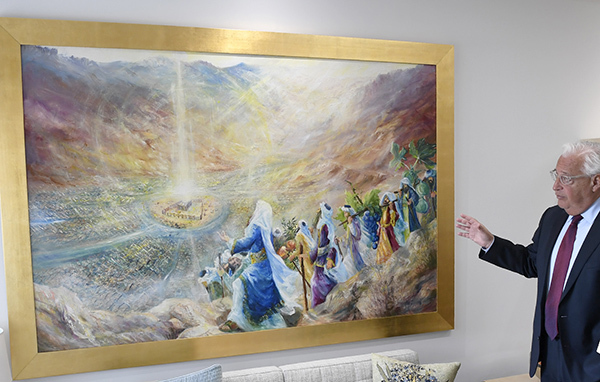 "There are many sins I may have committed in the past and commit today, but I keep this painting to remind me that there is really one sin you don’t want to commit on this job – that is, a lack of faith, a lack of vision, and a lack of confidence." We can all take a similar lesson for ourselves as we stand, as they did, having seen so many miraculous signs, we are poised to enter the land and be a part of the promises of God. The promises and covenants that Abraham, Isaac and Jacob all valued so much. We cannot, at this point especially, lack the faith, vision and confidence to do what God requires of us. Please join us again next week for more Bible in the News, God willing.